Not that I'm new to eye makeup..I've never done a post on it. And that's pretty much a reason why I posted this pic on Facebook yesterday, because I wanted to know if you guys really like it!! First of all conceal the under eyes. 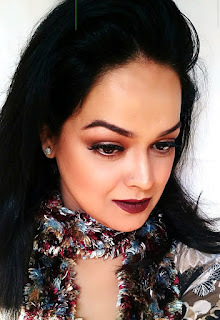 I have used colorbar concealer stick in Caramel treat. 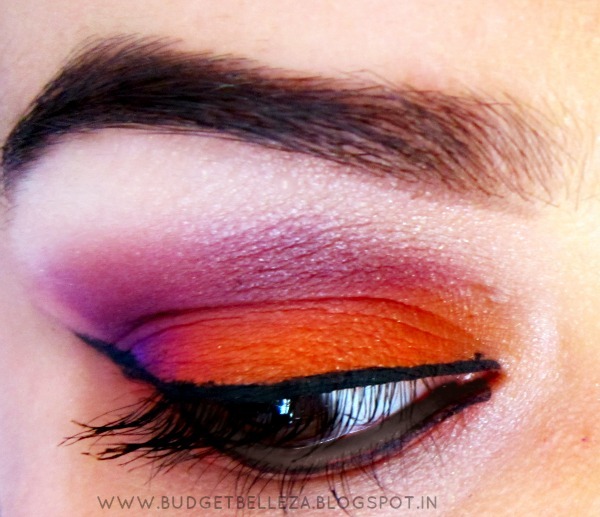 Apply a bright purple eyeshadow on the out corners of your eyes,making a V shape. Blend the purple eyeshadow in the crease as well. Blend..Blend..Blend for a seamless look. Apply a silver/off white eyeshadow on the brow bone. I've used Miss Claire eyeshadow no.0231 for highlighting the brow bone. Apply a black eyeliner (liquid/gel) giving it a slight winged shape. Apply kohl on your waterline. Now apply the same eyeliner below the lashline..corner to corner. Apply 2-3 coats of mascara..better still wear falsies! P.S. I'm new into the eye-makeup arena..so suggestion are welcome!! Seriously girl, this is so amazing...Hard to believe your first EOTD..you sure have been practicing a lot...I love the look...super duper !! OMG Arshita u made my day..Thanks u sooooo much! i LOVED IT!! so pretty! Would love to have you visit my blog too!